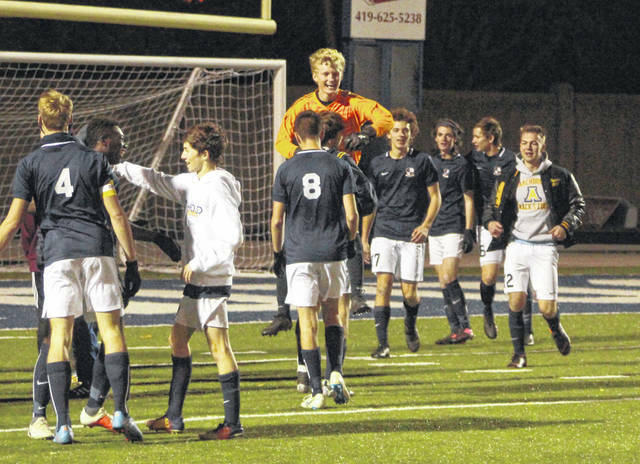 Archbold keeper Noah Cheney (in orange) and some of the Streaks show their excitement upon clinching a berth in the state title game with a 3-0 win over Kirtland in a state semifinal Tuesday. Elijah Zimmerman of Archbold drives the ball upfield versus Kirtland Tuesday. The Blue Streaks play for a state title Saturday in Columbus against either Dayton Christian or Grandview Heights. Andrew Hogrefe of Archbold, left, advances the ball upfield with Dean Springer of Kirtland defending. 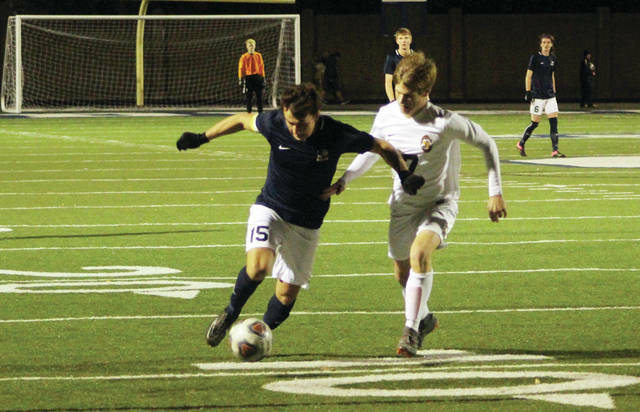 SANDUSKY – Archbold boys soccer will be competing for a Division III state championship Saturday after yet another impressive performance in tournament play Tuesday, defeating Kirtland 3-0 at Sandusky’s Cedar Point Stadium. The Blue Streaks were one of the state’s final four in 2015 where they came up short in the semifinal round. Now, they will get their shot at a state title. As for the game itself, Archbold appeared to have taken the lead just 2:39 in on a goal from Zimmerman, but it was waved off in light of a controversial offsides call. Zimmerman would get his redemption later in the half. With 12:38 left until halftime, he let one loose from the left side over Kirtland keeper Tyler Banyasz for a 1-0 Blue Streak lead. The Streaks carried that one-goal lead into the break, although it felt like they could have had more. Archbold got a much-needed insurance goal early on in half number two. Josh Kidder was awarded a free kick, finding the back of the net from roughly 25 yards out to make it 2-0 with 33:16 remaining. He tacked on another with under 30 seconds to play, putting an exclamation point on the victory. While many teams would be satisfied just making the state final, the Streaks have bigger aspirations in mind. Stewart aims to keep them on task in the days leading up to Saturday’s game. 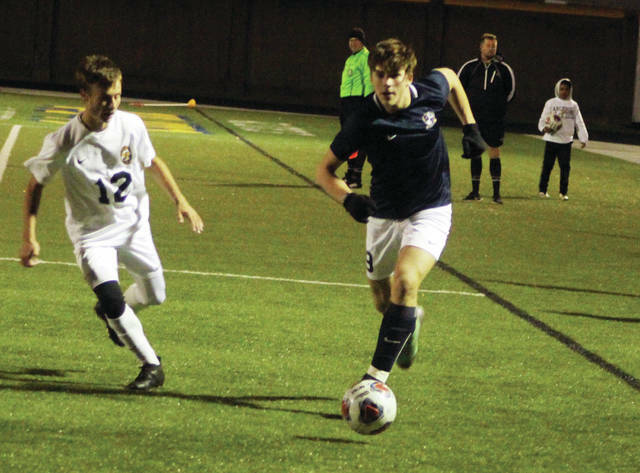 Archbold gets the winner of Dayton Christian and Grandview Heights for the state championship on Saturday at MAPFRE Stadium at a time still to be determined. Dayton Christian and Grandview Heights play tonight.